ESTERO, Fla. - Jan. 25, 2017 - PRLog -- Jeff East and Kevin Greenwell of East and Greenwell Insurance took part in the donation of a salvaged vehicle from Allstate Insurance Corporation to Jennifer Overfield and her family last week. The newly refurbished 2015 Ford Fiesta was made possible through a collaboration of several organizations. 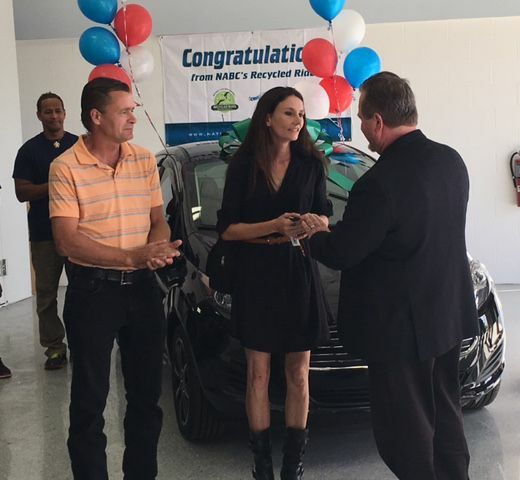 Allstate worked with Gerber Collision & Glass, Recycled Rides, Charity Cars, and Family Promise of South Sarasota County to provide the family with a car they couldn't otherwise afford. The presentation celebration was held last week at Gerber Collision, located at 10491 Corkscrew Commons Drive in Estero in conjunction with the Estero Chamber of Commerce. Jennifer and Stan Overfield and their four boys aged 6 to 14 of Englewood, Florida had been striving to get back on their feet in recent months. They both have jobs but had no car for transportation to and from work, school and elsewhere. Thanks to generous local businesses and a nationwide program called "Recycled Rides" developed by the National Auto Body Council, the Overfield's need for a reliable car was met. The National Auto Body Council comes together with insurers, collision repairers, paint suppliers, parts vendors and others collaborate to repair and donate vehicles to deserving individuals and service organizations in local communities throughout the country. Allstate Corporation's Florida claims department had identified a 2015 Ford Fiesta located in Fort Myers as a good candidate to donate to the Recycled Rides program. They contacted Charity Cars http://www.800charitycars.org/ and Family Promise of South Sarasota County http://www.familypromisessc.org/ for help in identifying a local family who needed a car. Steve Laszlo, Florida Regional Operations Manager for Gerber Collision & Glass and his Estero mechanics picked up the salvaged car and donated time and materials to refurbish it for the program. Parts were donated by Ford Motor Company, body work was completed, and every system was checked for condition and safety to put it back in like-new condition. "It was great to see how much this new car meant to the Overfield family, and we were thrilled to be a part of the donation," said Jeff East. It takes a generous and caring community of individuals and businesses willingly coming together to connect families with available cars to make the Recycled Rides program such a success. Together their generosity benefits so many struggling families far and wide by providing vehicles to help them overcome hard times. For more information about Recycled Rides, visit http://www.nationalautobodycouncil.org/. East and Greenwell Insurance Agency offers personalized insurance services to residents of Estero, Bonita Springs, Fort Myers, Cape Coral, Naples, and the islands. It offers insurance for property (homeowners, condo and renters), auto, flood, boat, umbrella, and life. Offices are located next to Miromar Outlets at 20321 Grande Oak Shoppes Blvd., Suite 308, Estero, FL 33928 and at 841 Vanderbilt Beach Road, Naples, FL 34108. For more information, call 239.672.4304 or visit www.EastandGreenwell.com. Gerber Collision & Glass of Estero is a subsidiary of The Boyd Group Inc., one of the largest operators of non-franchised collision repair centers in North America, providing collision and auto body repairs, auto glass and windshield replacement services nationwide at 367 locations. For more information, call (239) 949-6050 or visit https://www.gerbercollision.com/locations/estero-fl.